Scheduling and Straddling . . .
After checking off some more chores on my my list in the morning, I spent most of the afternoon working on the scheduling of our upcoming travels. I did find a really nice park near Rapid City for our week-long stay there and called to make reservations at the Passport America rate for the entire week. Nice. I was a little worried about getting this reservation since it straddled the Memorial Day Weekend, but luckily we had no problems. I’ve still got a few more dates to lock down, and a few more places to check out to stay and things to see. But it will all come together as usual. 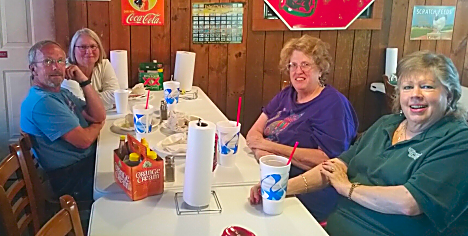 About 4:30 Jan and I headed up to Ellinger for the Friday Catfish Buffet at Peter’s BBQ, stopping off to pick up our Ranger friend, Barbara Spade. Also meeting us there were our next door neighbors, Bill and Val Fullerton. Bill and Val are kind of newbies, full-timing in their new Redwood 5th wheel just since December of last year. Before that they were longtime tent campers. We all had a great time talking about the RV lifestyle, and hope we’ll get back together soon. Tomorrow’s another ‘working through the checklist’ day before we head back down to Clear Lake on Sunday for a family get-together at the local Cheddar’s. Looking forward to it. Then on Monday Jan has her yearly appointment with her oncologist. in the afternoon. Originally we both had our yearly doctor visits that morning, but the doctor’s office called and rescheduled us until Tuesday morning. So that means two trips instead of just one. Then Wednesday we moved back over to the Lake Conroe Thousand Trails for a week before coming back to Colorado River on our way to Tucson.